Natural Stunning Picture Blue Peruvian Opal 925 Sterling Silver Solitaire Pear Pendant 32mm Long by Natural Rocks by Kala at Nicky's Blog. Hurry! Limited time offer. Offer valid only while supplies last. Handmade, natural product Stone: Natural Stunning Picture Blue Peruvian Opal Metal: 925 Solid Sterling Silver , The pendant is genuine earth mined . 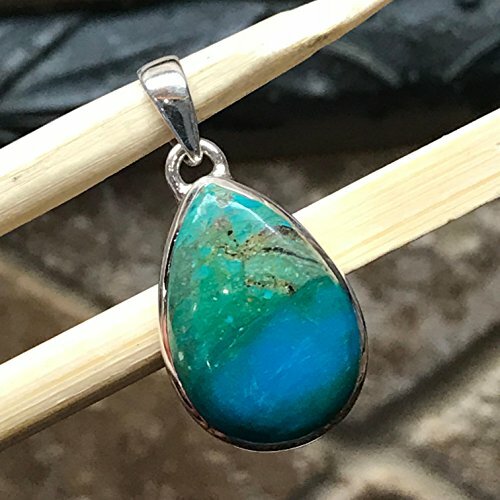 Handmade, natural product Stone: Natural Stunning Picture Blue Peruvian Opal Metal: 925 Solid Sterling Silver , The pendant is genuine earth mined . The pendant are made of solid sterling silver. This item is brand new. Common Opal from the Andes Mountains of Peru; translucent to opaque, soft pastel blue, blue-green or pink with a pearly sheen, sometimes cut to include the black or beige matrix in the more opaque stones. Andean Opal is considered to be a gift from Pachamama, the earliest Inca Goddess of Fruitfulness and Mother Earth, and is wonderfully soothing for children and animals, and adults overwhelmed by life. It is particularly useful for healing old emotional wounds, from this life or another, bringing an inner peace to carry one through difficult times. Andean stones promote right action for the highest good and stimulate connection with others and communication from the heart. They increases awareness of the need to heal the Earth, and are useful for those who manifest and transmute the changing vibration through their own body. Andean Opal is an excellent journeying stone, highly receptive, inducing a mild hypnotic state for enhancing divination and metaphysical gifts. These stones carry Water energy, and are great for activating the Heart and Throat Chakras. If you have any questions about this product by Natural Rocks by Kala, contact us by completing and submitting the form below. If you are looking for a specif part number, please include it with your message.